"Move a little closer. There's too much light." Evelyn shifts in the plastic bucket seat and flicks her wrist like a bird with a broken wing. "That's better." She squints her right eye and presses down hard on the plastic button of the disposable Kodak. "Good?" Harlan asks, smiling too late. "I didn't even take off my sunglasses." "Doesn't matter. It's just something to send to your kids. Let them know I haven't killed you yet." Harlan chuckles and shuffles over to the dryer, lifts up his large round glasses and peers into the top machine. "Almost done." "Don't open it. It'll mess up the cycle and we'll have to pump another two bucks into that pile of junk." Evelyn gets up and goes over to the large folding table. Harlan watches the way she forms piles of underwear and tee shirts. It's comforting to be taken care of again. When she gets to the sheets, Evelyn calls him over. "It's easier with two," she says. Harlan grabs the corners and lets Evelyn guide him until they have a perfect square. When they come together on the final fold he lingers for a minute to smell her perfume. Estee Lauder, Entice. It's the only kind she wears, and she has the whole set. Shower gel, lotion powder and the big bottle of cologne. The whole motor home smells like Entice, but that's fine by him. When she pops out to go to the pool for water aerobics or a game of cards in the hall, it's like she's never left. "Why don't you take those glasses off?" Evelyn pulls a small pink compact out of her purse and gives her face a good once-over. "Headache. Had one since I got up. I think it's the humidity." Harlan pulls a handkerchief out of the pocket of his Guevara and wipes his brow. He should have stayed in the motor home, but he couldn't resist the invitation to join her. Even if it was the Laundromat, it was better than staying home. Since they got to Sarasota and hooked up with the gals from Evelyn's nursing days, she's so busy flitting about socializing, he rarely sees her. The drive down to Florida from Ottawa had been heaven. He'd never driven a motor home before, and there was something powerful about being behind the wheel of that kind of rig. His kids told him not to go; that seventy-five was too old for that kind of road trip, and it was good to prove them wrong. He isn't finished yet. There were a few little fender-benders and a couple of times he hit the gravel off the I-95, but nothing to write home about. Besides, every time he swerved or the rig wobbled Evelyn would howl and clap her hands. She didn't have a care in the world, so why should he? Once the kids got to know her a little better, they'd love her as much as he did. She was a heck of a gal. Almost ten years his junior, she was reigniting a fire deep in his belly that he thought had been extinguished when Sharon died. And though it made him feel a little guilty, there was no mistaking that this fire was red-hot. "I've got Tylenol in my purse." Evelyn grabs her bag again and routes through the contents until she pulls out a large red bottle of pills. "You've got to take care of yourself, Harlan, I can't do everything for you." "You're right." He rummages through his pants pocket for change for the vending machine. It makes him nervous when Evelyn takes that tone. As much as he loves her, he could live without the temper. She'll fly off the handle without a moment's notice and when that happens, he really doesn't have a clue what to do. The only time his wife had raised her voice was when she sang in the church choir. Evelyn is another story all together. And the temper's only gotten worse since they arrived in Florida. Maybe it's the heat. He cups a handful of change and slides the quarters into the machine, but as fast as the coins go in, they come right back out. "Don't know what's wrong with this thing," he says, and slides them back in again. "They're Canadian, Harlan. Canadian. We're in the States, remember." Evelyn goes into her purse again and digs for change. "Didn't I tell you to put the Canadian coins in the jar next to the bed?" She was right, she had told him to do that, but he simply forgot. His memory wasn't what it used to be and on top of that, he's never been organized. He needs to start thinking more clearly if he wants to avoid these kinds of uncomfortable moments. It can't be easy putting up with the likes of an old guy. This afternoon when Evelyn's at her watercolor class, he'll go over to the tuck shop and buy one of those magnetized pads that sticks to the refrigerator. He needs to start making lists. "Move over." Evelyn nudges him aside and slips four American quarters into the machine. "I'm getting tired Harlan. Tired of having to worry about you. Charlie seems to make out okay. You don't see him pining away at the window every time Sylvia goes into town. He's always busy with something." She slams the button for the water with the palm of her hand and the bottle comes crashing down. Harlan pulls the cold bottle from the machine and goes to sit down. His head feels like one of the washers on the spin cycle. "You're right," he says, swallowing the two white pills. "I just like having you around. You can't blame a guy for that." Evelyn opens her mouth as if to start again, but the buzzer from the dryer sounds, and she dashes over and pulls open the door. "I don't want to be here all day. Grab the basket and give me a hand." Harlan slips off his sunglasses and takes the basket to Evelyn. He watches without speaking as she hauls towels out of the dryer. She's so driven. Everything she does has purpose. She makes even the most mundane tasks seem important. It's no wonder she gets so frustrated with him; he doesn't have the same conviction. "It's not that I don't appreciate what you've done, Harlan. Evelyn pauses and waits for him to carry the basket to the table. "The motor home, the trip, I couldn't have come here without you. You got me back on my feet." Harlan breathes out and smiles, even though he's the one who's really grateful. There'd been so many disappointments until he met Evelyn. He'd been so anxious to find someone to get rid of the loneliness that he hadn't made the best decisions. Meeting Evelyn changed everything. He reaches out to rub her arm, but she turns and digs back into the basket. "But with you moping around every time I leave the motor home, I can't relax. The other day Charlie asked me to be his partner in the Bridge tournament, and I said no. You know why, Harlan? Cause I didn't want to leave you home." Harlan's head pounds like a pair of sneakers in a dryer. He tries to focus on what she's saying, but he can't. He'd like to say that he'd do better; join lawn bowling or a yoga class, but the words don't form. The name Charlie reverberates in the hollow drum of his mind. That's the problem. It's not the nursing girls or the menu of activities that's keeping Evelyn from home, it's Charlie, and Harlan should have known it. The signals were everywhere. "What's wrong, Harlan? You're as white as a ghost." Evelyn stops her folding and reaches out to put her hand on his forehead. "You'd better sit down." She takes his arm and guides him over to the seats along the wall. "Just one more load and we'll go home." Harlan nods back and blinks his eyes a few times; tries to pull himself together. Maybe he's making too much of everything. Evelyn's here with him, not Charlie, and he's blowing things out of proportion. Simple. It's odd there's nobody else here. Doesn't anyone have laundry to do? Maybe they're all lined up at the clinic for free blood pressure testing. Charlie's probably there now. A cool 120/80 and all the nurses cooing over what great shape he's in. Seventy years old and the ticker of someone half his age. Harlan can hear it all now. "Any better?" Evelyn stops what she's doing and turns around. "You want to go without me? I can get someone else to help me take things back." Harlan shakes his head and gives a thumbs up. He can help her back just fine. Once the pills kick in he'll be right as rain. No doubt Charlie would love to step in and help her out. He'd probably carry the basket back on his head. Evelyn would giggle and say they needed to get back to make sure Harlan was okay. No, he'd rather pass on that little scenario. The even rhythm of the sneakers in his head relaxes him, and he drops his shoulders a bit. From the corner of his eye he notices the camera on the seat next to him. Evelyn's forgotten it. He picks it up and peers through the square lens. Things are blurry, but he can make out her thick red hair and yellow cardigan. She's so beautiful, he needs to get one shot; freeze the moment like a sculpture at Winterlude. He stands up, using one arm to steady himself on the back of the chair while he gets his bearings. His thick finger gropes the top of the camera until he feels the round hollow of the button and he gently pushes down. The loud buzz the dryer makes just then masks the snap of the button and the click of his knees before they buckle and he hits the linoleum. He grasps the camera and watches Evelyn rush to the dryer. She doesn't know what's happened, but then again, neither does he. He'd like to call out but his lips won't move. It's the pain in his head that sounds an alarm, but he's the only one who hears it. Evelyn will turn soon and when she does she'll laugh at his clumsiness, help him up, and they'll fly home together. Harlan pulls the camera in close to his chest and closes his eyes. You are a talented writer. I could tell right off the bat. I love your strong characters and your constant use of imagery. Your writing comes alive for me. I hope you continue to pursue your talents for many years to come. You left me wanting more. This is such a nice story. The characters were very vivid. The story was very tight without a lot of wasted imagery, and the pace of the story was perfect. Plus you left us wanting more which is always a good thing. It was a pleasure to read through your story, Carolyn, and your description of Harlan's stroke at the end left me hoping he made it, and that you'll give us more and that this "elderly" couple will make it -- together. Really great job Carolyn, you left me wanting more, the characters, especially Harlan, felt so real and in a short space of time I felt I knew them. 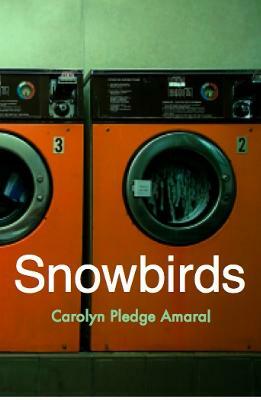 More than a story about the life of the "Snowbird"
This is an interesting approach to the often romantized life of the roaming "Snowbird". The story clearly demonstrates the excitement of the rookie snowbird behind the wheel of an RV but also the excitement of being in a second relationship. As your story demonstrates, this road of excitement can also have large bumps and potholes. You made us feel the excitement but also the despair - perhaps more for the male character but also for the female character who is portrayed as being selfish and demanding. Clearly she has become an unhappy, dominating individual. Perhaps a follow-up story would explain why? A likeable writer has forged a psychological narrative, subtly examining the theme of codependency and abuse: both from another and self. I always endorse those women who are brave enough to highlight to the feminine machinery that abuse is no less viciously inflicted by a woman than a man. Great job, Carolyn. Waiting to see a few more Snowbirds (perhaps Longtails?) fly off the roost. You did a wonderful job. In such a short amount of time I felt like I knew the characters in the story much better than I should. You were able to portray Evelyn and Harlan in such a way that I wanted to know more about them, using my own imagination to expand on your story. You have done a great job of capturing the essence of this relationship in a moment in time. You have given us just the right clues to fill in the parts of the story that make this so sad for Harlan. Any one that has felt the pull of their heart against all logic will relate to your story. I love this story. You have done such a lovely job of pacing and have written such believable dialogue. You make the characters very real and you make us care about Harlan right away. You move the story along nicely in real time with just enough background information to fill in all that is needed. It moves toward the end in a surprising way. Your story is flawlessly executed from start to finish!